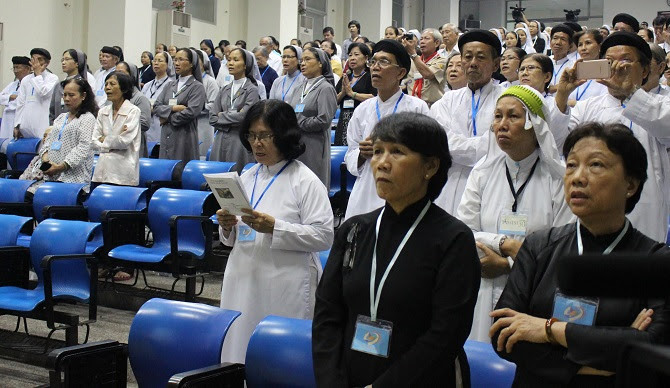 Vietnamese Catholics invited people from various religions to come together to celebrate interfaith harmony at an event in Ho Chi Minh City to highlight Pope Francis' message for the Year of Mercy. 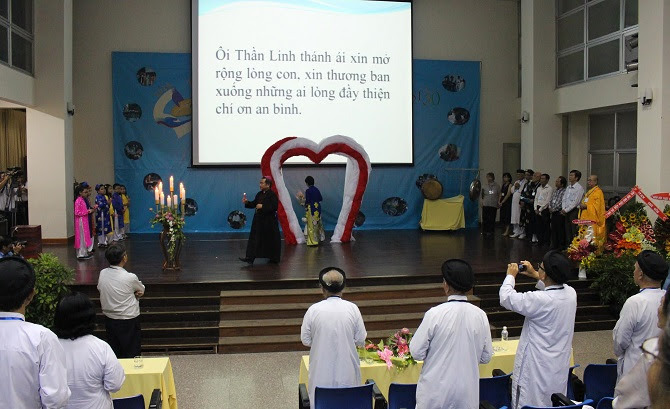 Some 500 people attended including followers of Baha'i, Buddhists, Hindus, Protestants, as well as those from the Cao Dai and Minh Ly Thanh Hoi indigenous faiths. The meeting was themed, "Blessed are the Merciful." 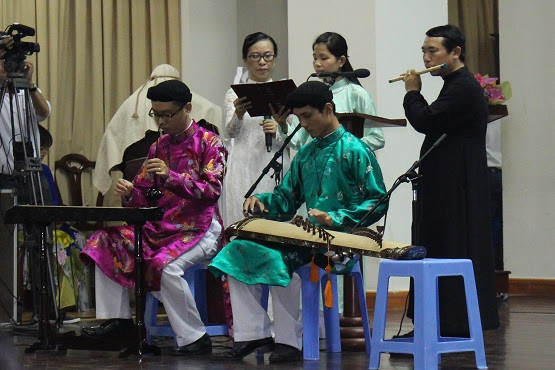 The event was held by the Ministry of Interfaith Dialogue Committee of Ho Chi Minh City Archdiocese at the Pastoral Center on Oct. 27. Archbishop Paul Bui Van Doc of Ho Chi Minh City and Bishop Stephanus Tri Buu Thien of Can Tho, who is in charge of the Vietnamese bishops' interfaith dialogue committee, were present. "The Christian purpose of the meeting is to celebrate the Year of Mercy together with followers of other faiths," Father Francis Xavier Bao Loc, head of the organizing committee, told ucanews.com. Father Bao Loc said followers of different religions share a common interest in doing charitable work and bringing mercy to others. Attendees were invited to share their charitable activities. All had stories to share: about caring for those with leprosy, elderly people without relatives, poor patients and the marginalized, all kinds of people in need. Dai Co Minh, a follower of Minh Ly Thanh Hoi, a sect that combines Buddhism with animism, shared that over 20 doctors, physicians and followers from various religions worked together at the Tam Tong Mieu free clinic to care for dozens of poor patients every day. "We work in harmony and respect one another because we all are children of one Father. We want to show human mercy to people," Minh said. Bishop Thien said followers of various faiths are sensitive to the distress of their fellow humans. "Although we are from different faiths, we are from the same home and nation," he said, citing a Vietnamese proverb of similar meaning. Hong Phuc, from Cao Dai, another syncretistic sect, said he enjoyed the warm atmosphere. "We are brothers and sisters from the same God in Heaven. We have the same aspiration to serve people with love from the Creator. Only selfless love can help people live up to God's will and serve humankind," she said. The meeting featured cultural performances, songs, dance, drama, calligraphy and photos of interfaith activities. Attendees were also briefed on St. Mother Teresa of Calcutta who visited Vietnam four times in 1991-1995 to establish a convent before her nuns were expelled from the communist country. The Missionaries of Charity congregation that the saint founded works for the "poorest of the poor." Pope Francis canonized her on Sept. 4 at the Vatican. The communist government of Vietnam has allowed for freedom of religion within strict boundaries since 2003. The meeting was brought to a close with the representatives from religions praying for mercy, harmony, love and peace to be in the world according to their own religious traditions. Pope Francis declared the "Year of Mercy" encouraging people to "be merciful like the Father." Pope Francis declared the "Extraordinary Jubilee of Mercy" beginning past Dec. 8 on the feast of the Immaculate Conception and concluding Nov. 20 on the feast of Christ the King.